Young Emms she did daily mourn since Edwin first did roam. What he did gain upon the main and above the Lowlands Low. Your name is young Edwin who ploughed the Lowlands Low. We will send his body sinking down in the Lowlands Low. Because she lov'd him dearly that plough'd the Lowlands Low. For murdering my Edwin that's down in the Lowlands Low. Reminds me of my Edwin that's down in the Lowlands Low. OF THE MAN OF WAR. The one appeared a virtuous maiden. To sail on board a man of war. I'll bid adieu to the man of war. With you on board of a man of war. Nor sail with me in a man of war. Till you return in a man of war. With William in the man of war. George Walker, Jun., Printer, Sadler-Street, Durham. Two ballads. 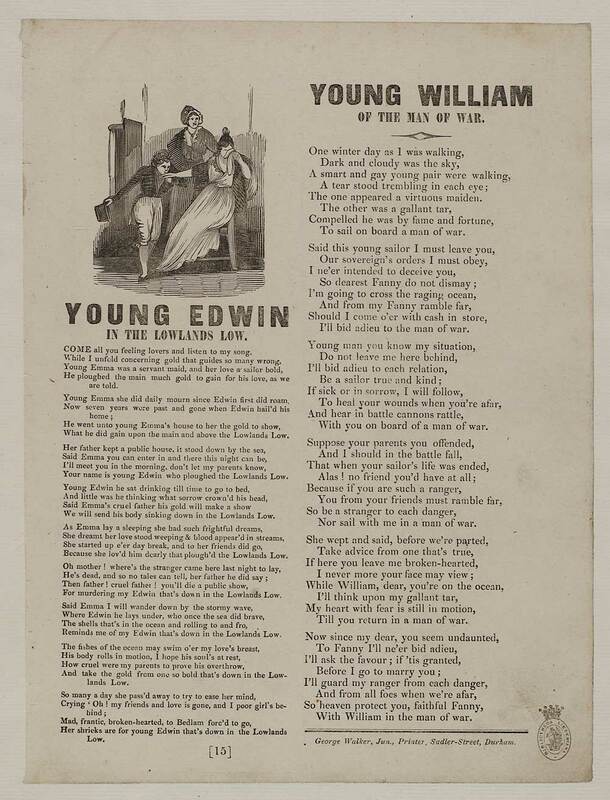 Young Edwin in the Lowlands low - first line reads: Come all you feeling lovers and listen to my song. Young William of the man of war - first line reads: One winter day as I was walking.